Rafael Nadal is not one of those blinkered tennis players who absolutely refuses to look ahead in a draw. Taking part in the 2018 Rogers Cup draw ceremony on the 43rd floor of Bisha hotel in downtown Toronto on Friday, the world No. 1 explained that, while his main focus is on his next opponent, he has no problem looking at the bigger picture, at interesting head-to-heads throughout the draw. And he did indeed turn and look at the match-ups as they appeared on the video board behind him. Playing in his 11th Rogers Cup – he won the title in 2005, 2008 and 2013 – the 32-year-old was asked about his favourite memories of the tournament in Canada. He cited 2008, when a win in the final over Nicolas Kiefer in Toronto propelled him to No. 1 in the ATP rankings for the first time, and 2013 in Montreal, when he came back from injury and a tough loss to No. 135-ranked Steve Darcis at Wimbledon to beat Novak Djokovic 6-4, 3-6, 7-6(2) in the semi-finals and Milos Raonic in the final. Next week after a bye, on Wednesday night he will begin his quest for a fourth Rogers Cup title against the winner of a match between a qualifier and the talented but tempestuous Benoit Paire. The Frenchman was fined $16,500 US after a complete meltdown – multiple racquets smashed – following a loss to Marcos Baghdatis in Washington this week. Probably the most notable outcome of the draw is that there’s a possibility of a re-match – but only in the final – of the fabulous semi-final between Nadal and Djokovic at Wimbledon less than three weeks ago. Djokovic, ranked No. 10 and seeded No. 9, starts out against Hyeon Chung of South Korea and then could possibly face defending champion and second seed Sascha Zverev in the quarter-finals. The big popcorn match in the draw is Stan Wawrinka, who got a wild card when Andy Murray withdrew after his three-hour, 3 a.m. Friday finish against Marius Copil in Washington, versus Nick Kyrgios. But the unpredictable Aussie has had injury issues the past two weeks in Atlanta and Washington and could be a question mark. As for the Canadians, on a scale of one to 10, they have drawn opponents in the five to nine range. Denis Shapovalov, hoping to rekindle the magic from last year in Montreal when he reached the semi-finals, starts out against Jeremy Chardy. After a stellar 12-2 record on grass pre-Wimbledon, Chardy was favoured when he faced Shapovalov in the first round at the All England Club last month. But the 19-year-old from Richmond Hill, Ont. proved to be the sharper player and prevailed 6-3, 3-6, 7-5, 6-4 against the 31-year-old Frenchman, currently ranked No. 43. In the second round Shapovalov would take on either Steve Johnson or Fabio Fognini. Further, in the round-of-16, he is projected to meet No. 3 seed Juan Martin del Potro, whom he beat a year ago in the second round in Montreal. Del Potro is still active in the Los Cabos, Mexico, ATP 250 event. Milos Raonic, playing in his fifth Rogers Cup in his hometown of Toronto, is matched against No. 11 seed David Goffin in the first round. Both 27-year-olds born in December, 1990, Raonic and the Belgian have split 4 four previous meetings as well as dividing their only two matches on hard courts. A win and Raonic would face either French Open semi-finalist Marco Cecchinato or 20-year-old American Frances Tiafoe in the second round. In the round-of-16 he could play another contemporary, No. 5 seed Grigor Dimitrov, who has fallen on hard times – going only 3-5 at his last five tournaments, including Roland Garros and Wimbledon. The other Canadians, all in the event via wild card, are Vasek Pospisil, Peter Polansky and 17-year-old (until next Wednesday) Felix Auger-Aliassime, playing in his first Rogers Cup main draw. A year ago he and Shapovalov were to feature in a Tuesday matinee double-bill in Montreal but Auger-Aliassime had an injured left wrist and couldn’t play. For his debut he will face No. 19-ranked Frenchman Lucas Pouille, 24. Auger-Aliassime is currently at a career-high ranking of No. 134. Pospisil, whose best Rogers Cup was a memorable 6-4, 1-6, 7-6(4) loss to Raonic in the 2013 semi-finals in Montreal, will play No. 21-ranked Borna Coric. The two have only one previous meeting – Coric prevailing indoors on red clay 3-6, 6-2, 6-3, 6-2 in a Davis Cup match in Osijek, Croatia, in February. Polansky will take on Matthew Ebden in a battle of 30-year-olds. Currently ranked No. 122, Polansky, in Ebden, is facing a late bloomer who reached a career-high No. 43 last month, and is now No. 50. The Aussie won his two previous meetings with Polansky – in Memphis in 2017 and at the Rogers Cup in Toronto in 2012. There are five Canadians in the qualifying, which begins at 11 a.m. – free admission – on Saturday at the Aviva Centre. They (rankings in brackets) range from 19-year-olds Benjamin Sigouin (679) of Vancouver and Alexis Galarneau (572) of Montreal, to 33-year-old Frank Dancevic (290) of Niagara Falls, Ont., but now living in Montreal. Also in the qualifying are 24-year-old Filip Peliwo (203) of Vancouver and 23-year-old Brayden Schnur (249) of Pickering, Ont. Talk about a shocker for the Coupe Rogers in Montreal – if No. 26-ranked Serena Williams is able to defeat No. 34-ranked Alizé Cornet of France in the first round, she will face No. 4 seed Angelique Kerber, who has a bye, in the second round. That would, of course, be a re-match of the Wimbledon final – with both players (embracing above) having only played one match between them since that July 14th encounter. That would be Williams’ inscrutable 6-1, 6-0 loss to Johanna Konta in her opening round in San Jose on Tuesday. It would certainly get the attention of the tennis world and so most people will be hoping the 36-year-old Williams get past Cornet and does in fact play Kerber. Another fascinating possible second-round match-up would be Maria Sharapova (plays a qualifier) vs. her talented, young Russian compatriot Daria Kasatkina (plays Maria Sakkari of Greece). There are three Canadian wild cards in the draw and two of them – Genie Bouchard and Carol Zhao have drawn tough opponents. The third, Francoise Abanda, seemingly gets a break and will face a qualifier. Bouchard has drawn No. 15-ranked Elise Mertens. 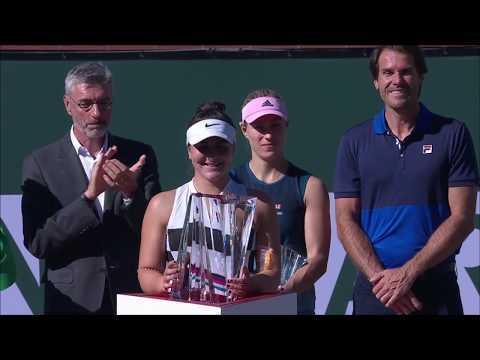 The 22-year-old Belgian was an Australian Open semi-finalist in January and defeated Bouchard in their only meeting – by a 6-2, 6-0 score on grass in S’Hertogenbosch, the Netherlands, in 2016. Carol Zhao, 23, of Richmond Hill, Ont., will play No. 18-ranked Kiki Bertens of the Netherlands. There are fully seven Canadian women in the Coupe Rogers qualifying, which starts tomorrow at 11 a.m. at Stade IGA – free IGA Family Weekend. They are Leylah-Annie Fernandez, Isabelle Boulais, Rebecca Marino (plays Vera Lapko of Belarus), Katherine Sebov, Gabriela Dabrowski, Catherine Leduc and Vera Vagramov. Mikhail Youzhny has had a pretty successful tennis career. He reached a career high ranking of No. 8 in 2008 and has made the quarter-finals of all four Grand Slam events – and you can throw in one semi-final at the 2010 US Open as well. He has also earned over $14 million US in prize money. The 36-year-old Russian has announced he will retire after the ATP 250 event in St. Petersburg, Russia, in mid-September. His current lifetime match record is 498-412. So will he reach the 500 (main draw) match win milestone? Now ranked No. 102, he’s playing qualifying at this week’s Rogers Cup, same thing in Cincinnati in two weeks and then has a fighting chance to get into the US Open main draw because he’s currently just a couple of spots out. Then it’s St. Petersburg – so he basically has four events to win two matches to get to 500. One thing he likely will not do, unless it happens in Cincinnati or the US Open, is improve on his futility – 0-17 – against Roger Federer. That extends from their first meeting in Stockholm in 2000 to the second round of last year’s US Open. Youzhny shares the 0-17 vs. Federer mark with his fellow 36-year-old, David Ferrer. The 0-for record vs. Federer is not matched by his head-to-head against the game’s two other dominant players – he’s 4-13 with Rafael Nadal and and 3-7 against Novak Djokovic. Youzhny’s remarkable career includes ranking in the top-100 for 17 years in a row – from 2001 to 2017. The Muscovite is married with two sons – Maxim, 8, and Igor, 6. In the first round of qualifying on Saturday he will face No. 679-ranked Alexis Galarneau, 19, of Montreal. This happens frequently in tennis – the week before the Citi Open in Washington, Denis Shapovalov and Kei Nishikori practised together in Bradenton, Florida. Then they played in the round-of-16 in Washington on Thursday with Nishikori being a 7-6(1), 6-3 winner. That makes their head-to-head 1-1 – Shapovalov having won their previous meeting this year in Acapulco. NOTE: Back with first blog from Rogers Cup on Monday.